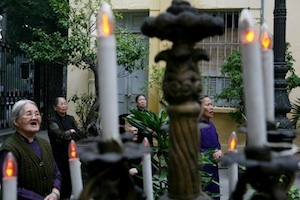 Catholics in three northwestern Vietnamese provinces have defied a government ban on religious activities by gathering at people’s homes to pray. Joseph Nguyen Van Tien, who lives in Dien Bien province’s Muong Ang district, said that he started inviting local Catholics to pray at his home three months ago. “I am very happy that 120 local Catholics now gather regularly at my home on Sundays to pray,” he said. “We fear nothing because we gather to pray for ourselves to live better lives and for our relatives on their death anniversaries,” said Tien. “We do not cause public disorder.” Pastoral activities for Catholics in Dien Bien and Lai Chau provinces, where religious activities are banned, started in 2007, says Father Pierre Nguyen Thanh Binh from Sa Pa church in Lai Chau. At that time, small Catholic communities gathered at homes for prayers. There are now more than 4,000 Catholics attending such meetings. Many Catholics say they want the local government to recognize their religious activities and allow them to build churches. This article also appeared in print, under the headline "Catholics in Vietnam Defy Government," in the September 27, 2010 issue.